Chocolate & nuts are a delicious pair! The combination of chocolate and nuts is a very popular one. The sweet, delicious chocolate pairs nicely with the salty taste of the nuts, creating a complex flavor.There are many types of nuts that have distinct tastes, and when you consider the different cacao percentages, you can create almost endless combinations of chocolate and nuts. Both milk and dark chocolate pair well with nuts; it doesn’t matter which type you choose, meaning that no matter which kinds of chocolate or nuts you prefer, you can find a satisfying combination. Here’s some interesting information about this excellent pairing. Milk chocolate is the go-to choice for chocolate lovers. They like how sweet it is and how it can be paired with a wide variety of other foods. The pairing of milk chocolate and nuts is one that offers people the best of both worlds: sweet and salty. Milk chocolate-covered peanuts are a tasty example of this delicious pairing. The flavors complement each other so well they’ll have you reaching for more! Dark chocolate, which is less sweet than its milk chocolate counterpart, also pairs well with nuts but in a different way. The contrast between sweetness and saltiness is not as significant when dark chocolate is combined with nuts, but the resulting flavor is still delicious! 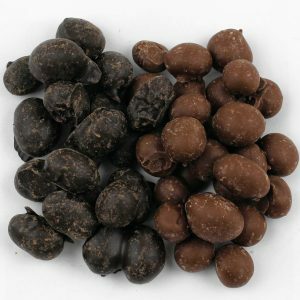 Also, the health benefits provided by dark chocolate, combined with the nutritious properties of nuts, make treats like our assorted dark nuts a health-conscious option. Cashews, for example, contain high levels of magnesium, iron, and fatty acids. When combined with dark chocolate, which has been proven to improve blood flow, you have a heart-healthy snack. Who knew that foods that taste this delicious could be good for you too? DELICIOUS CHOCOLATE & NUT PAIRINGS AT WOCKENFUSS CANDIES! Wockenfuss has all of your favorite dark, milk, and white chocolates! Whether you prefer truffles, nut bark, or sugar-free chocolates, Wockenfuss has what you and your loved ones desire. Since 1915, Wockenfuss has been a family owned and operated business creating the finest confections in Baltimore, Maryland. With our nine convenient locations throughout Maryland, there is sure to be a Wockenfuss store near you. Come and visit us to see our selection of favorites such as our gourmet truffles, chocolate specialties, and much more! This entry was posted on Friday, January 18th, 2019 at 3:37 pm. You can skip to the end and leave a response. Pinging is currently not allowed.